This is a memorial to Tina Lindeboom, born in Drachten (The Netherlands), for her help to Allied airmen. It is located in Nevada City, California, in front of the Veterans Building. Tina (Tine, Trijntje) Lindeboom was born in Drachten 22 March 1911 to Eize Jan Lindeboom and Aukje Stienstra. 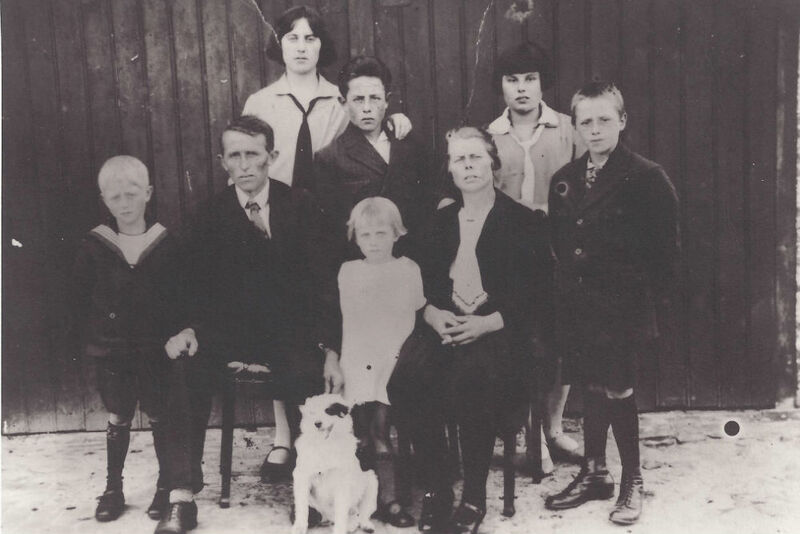 She and her family (picture 3) emigrated to the United States in 1929 when she was 18, settling in Clearwater, Los Angeles County, California. Clearwater was a dairy farming area and later became part of the city of Paramount. She returned to The Netherlands on June 30, 1936 and was married to Age Salverda on September 24. Their son, William Age Salverda, was born July 2, 1937. Tina and Age Salverda were divorced January 5, 1946. Her file as a helper of Allied airmen in the National Archives shows that she collected money and clothing for 'onderduikers' (Dutch men hiding from the Germans) and airmen. She hid at least three American airmen, Paul Moseley of Brookfield, Missouri; Marlow B. Olson of Briston (sic, should be Bristow), Nebraska; and James Moulton. Both Moseley and Olson were with the 453rd Bomb Group. Moseley stayed with her for two weeks, Olson two days and Moulton one day. Names of other airmen she may have helped are not known. In his memoirs, Moseley says: "I had a back injury from when we bailed out and there was a Dutch doctor with the underground who took care of me. Moving through the underground from the home of a woman and her little boy in Drachma (sic)....". The doctor referred to is undoubtedly Dr. Johannes Siebinga, a well-regarded medical doctor and amateur archaeologist whom Tina married in 1946. Tina's helper file lists as her primary contacts "Dr. Siebenga (sic), J. Zÿlstra and Ds. Buitenbos." The identified airmen were delivered to her by the following: J. Zÿlstra (Moseley), P. Blom (Moulton) and Ds. de Groot (Olson). Tina Lindeboom (picture 4) returned to the United States in 1971, following the death of Dr. Siebenga in 1969. She died on February 6, 1984 in San Jacinto, California. 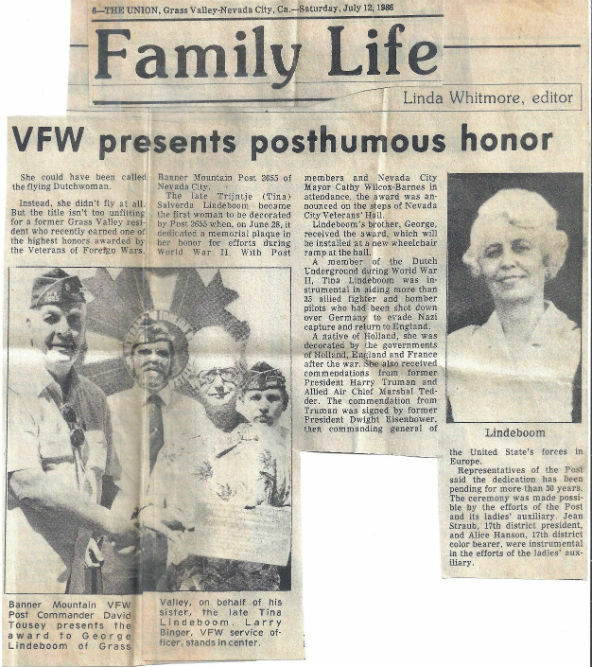 The memorial was put in place by her younger brother, George Lindeboom, active in the Veterans of Foreign Wars (VFW), who lived in Nevada County where the memorial is located. He moved to San Jacinto in 1989 where he continued his activity in the VFW. He died on July 18, 2007. He was a Pearl Harbor survivor.